Babies outgrow their clothes so fast that it only makes sense to sew them. 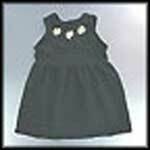 Use free baby patterns and sew clothes like gowns, sleepers and booties. There's even projects for accessories like a baby sling or crib sheets. Make a diaper bag to coordinate with the colors in baby's room. There are lots of baby patterns for hats and bonnets. There's never enough receiving blankets so sew your own or sew some for the next baby shower. 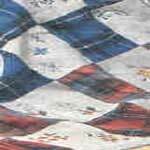 This is a great project to make with the fabric scraps you have accumulated. And you can even use old flannel shirts for the flannel. 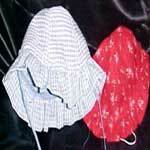 Sun bonnets do more than look cute, they protect a child's head, ears and neck from sun damage. 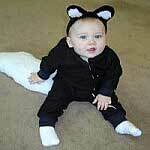 Here are some fun animal costumes that are perfect for infants and toddlers, as well as children of all ages. Sheep, bunny, turtle, puppy, cat, bug, spider web, tiger, cow, pig, dinosaur, mouse, ladybug, bear and a butterfly. Fits up to 8 lbs. Interlock knit works best for these sleepers. 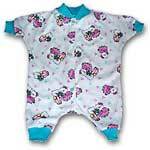 Footless sleeper fits 4 to 6 lbs. Interlock knit works best for these sleepers. 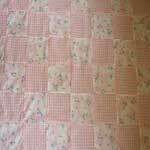 This is an easy and fast patchwork baby quilt project. 25 patterns in age categories for babies! Several projects to pick from for baby, such as a bonnet, bunny bib, soft blocks & more. It is so easy to sew a fitted diaper and here are instructions to help you get started. Make your own burp cloths using this easy pattern; they make great gifts. Make baby this sweet little bib by using the instructions plus a little imagination. This is an easy hat to make for the baby or toddler in your life.